Everyone tells a different story about why you get black streaks and where they come from. "Oh, they come from the rubber roof on my camper", "No, they come from the aluminum roof on my horse trailer", "Your both wrong, they come from silicone around the windows." Well, here is where a black streak comes from. Black streaks come from any water or moisture that runs down the surface of anything. As the water runs down the side of a camper, trailer, boat, or anything it has pollutants in it. Some of these pollutants are left behind as the water runs. The more rain or moisture there is the faster the pollutants build up, thus a black streak is formed. 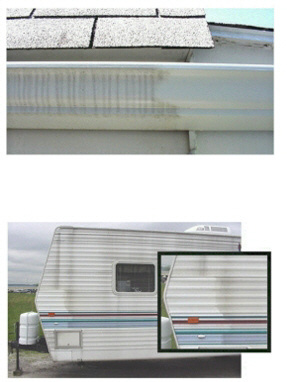 The dirtier the the roof is on your camper or trailer, the faster the black streaks will form, because this will only add more dirt to the water as it runs down. Around windows on campers and trailers, the water gathers on top and then runs down in more concentration on each side of the window. Black streaks will ruin your investment if left untreated. They are like a fast stream cutting through a mountain side, only these streams are cutting through your vehicle's finish. If you have black streaks and stains that have set deep into the paint finish over time, you will need our black streak remover. We recommend this product when the stains have gone extremely deep into the paint and have been impossible to remove.